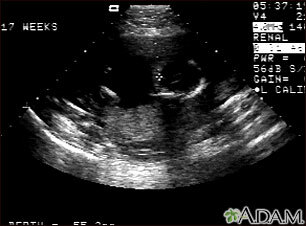 This is a normal fetal ultrasound performed at 17 weeks gestation. The development of the brain and nervous system begins early in fetal development. During an ultrasound, the technician usually looks for the presence of brain ventricles. Ventricles are spaces in the brain that are filled with fluid. In this early ultrasound, the ventricles can be seen as light lines extending through the skull, seen in the upper right side of the image. The cross hair is pointing to the front of the skull, and directly to the right, the lines of the ventricles are visible.